In the materials science realm, porous materials that are small in size, but have the surface area of a football field, are extremely valuable because they can capture and store large amounts of gas molecules, and they have catalytic properties. These materials include covalent organic frameworks (COFs) and metal organic frameworks (MOFs). It’s easy for scientists to manipulate their chemistry to create more materials because of their synthetic tunability. However, creating MOF and COF materials is a lengthy, laborious, multistep synthesis process involving linkers and struts—that look a lot like Tinkertoys®—at the molecular scale. The process can be used to design “tailor-made” structures but runs the risk of failure along the way when trying to create a desired MOF or COF. Results: Materials scientists at Pacific Northwest National Laboratory have come up with a new approach to synthesizing porous materials leading to the creation of a new class of materials called coordination covalent frameworks (CCFs). This approach uses the combination of MOF and COF chemistry in two steps, making the synthesis process faster and easier. Their results appear in ACS Applied Materials and Interfaces. 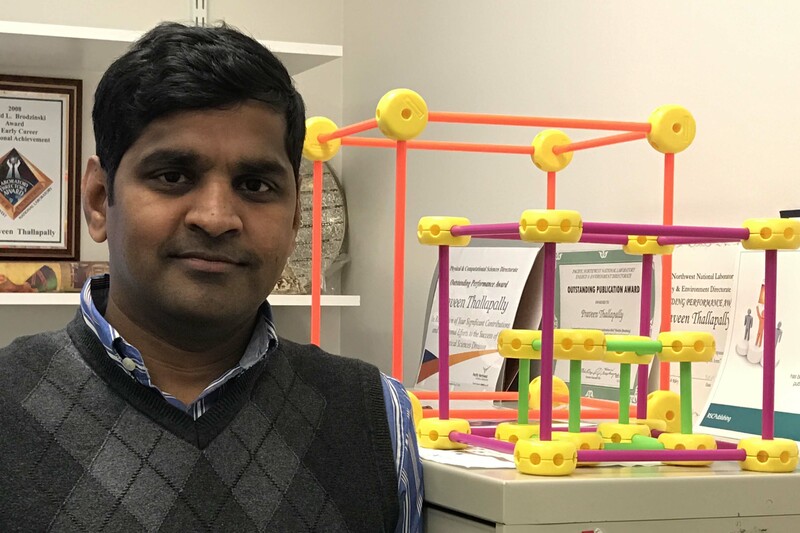 PNNL materials scientist Praveen Thallapally is shown with Tinkertoy® models of covalent organic frameworks (COFs) and metal organic frameworks (MOFs), porous materials that typically have the surface area of a football field. He and his colleagues have come up with a new approach to synthesizing these materials leading to a new class of materials called coordination covalent frameworks (CCFs). This approach combines MOF and COF chemistry in two steps, making the synthesis process faster and easier. According to Thallapally, Dr. Sameh Elsaidi, a postdoctoral researcher in the materials group, came to him one day with a new view of the Tinkertoy model. “Sameh had created a non-porous (no surface area) molecular building block (MBB) in one step with metal clusters (circular pieces) and organic linker (sticks) that has an amino group at one end of the linkers. This became the basis of the new, two-step approach that resulted in CCFs,” Thallapally said. The condensation reactions were used in COFs between amines and aldehydes to form an extended structure. The same COF approach was used in the second step to create a CCF material. The MBBs were isolated using 4-aminobenazoic acid and Cr(III) salt. They were then polymerized, a process that forms strong covalent bonds where small organic molecules can connect the MBBs, forming extended porous CCF material with high surface area that can selectively separate gases. Why It Matters: The researchers have basically eliminated the multi-step synthesis to make extended organic linkers that were typically used in the MOF and COF synthesis to form a high-surface-area material. In principle, the two-step method can create high-surface-area materials. Illustration of the two-step synthesis approach. 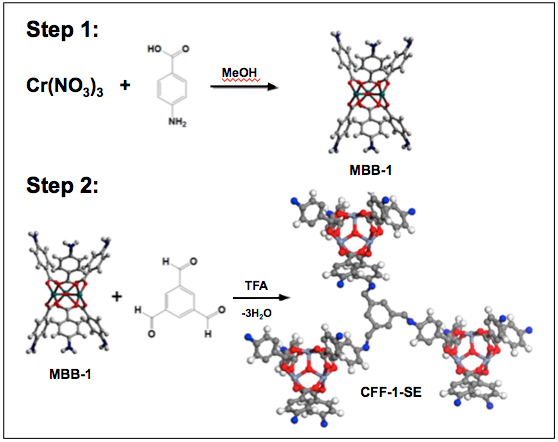 Step 1 shows MOF chemistry to generate isolated MBB-1, and Step 2 shows the polymerization reaction of MBB-1 with tri-aldehydes (COF chemistry) to result in a CCF-1. The scientists used Fourier transform infrared analysis to prove the formation of amide or imine bonds in the CCF structures and show how this material is different than the original MOF building block. Gas adsorption measurement revealed that all polymerized CCFs were permanently porous. Thus the two-step approach opens a new avenue to this class of materials that merge coordination (MOF) and covalent synthesis (COF) approaches. What’s Next: The scientists hope to adapt the two-step approach to create CCFs with different catalytic sites within the framework. They hope to patent the process and materials. Sponsors: The work was based on research done on geothermal brine solutions for the Department of Energy’s Office of Energy Efficiency & Renewable Energy (EERE). Research Team: Sameh Elsaidi, John Loring, Pete McGrail, and Praveen K. Thallapally, PNNL; Mona Mohamed, Alexandria University, Egypt. In one sentence: Materials scientists at Pacific Northwest National Laboratory have come up with a new approach to synthesizing porous materials leading to the creation of a new class of materials. In 53 characters: PNNL material scientists create new class of material.